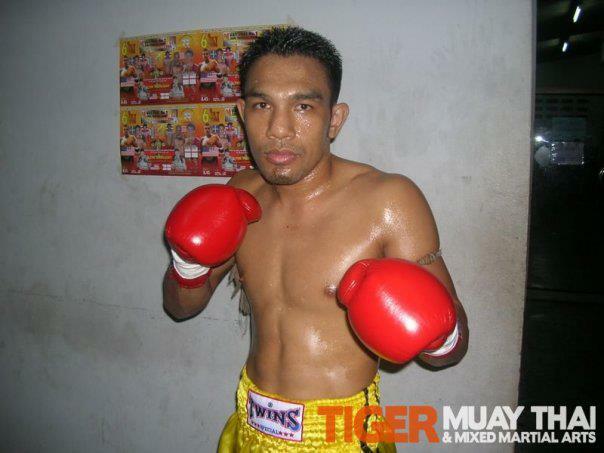 Former Tiger Muay Thai & MMA Phuket trainer Prathet Sor Tanikul, is flying the orange and black colours this weekend as he prepares for his latest bout on British soil. Prathet arrived at Tiger in 2004 and spent seven successful years at the camp as a trainer and competitor. No stranger to island life, 33 year old Prathet will be swapping tropical Phuket for the temperate island of Jersey this weekend. Prathet will compete at the third annual Kings Of The Ring promotion at the prestigious Hotel De France on Saturday May 26th. He takes highly ranked U.K fighter, Panicos Yusef in what is set to be a show stealing bout. In 2011, Prathet and his English wife made the move to her native United Kingdom where he continues to teach and train Muay Thai. Although a true Thai at heart, Khon Kaen born Prathet has quickly embraced British culture and sport. Cultural differences aside, Prathet knows he must adapt his fighting style in order to triumph against a growing number of well schooled English Muay Thai students. Since arriving in England, veteran Prathet has made a name for himself as one of the most experienced fighters on the British Muay Thai circuit. Using his wealth of knowledge, he teaches seminars to aspiring fighters and encourages all of his students to visit Tiger Muay Thai & MMA Phuket. With overseas success on the horizon, Prathet is quick to credit Tiger for his successful career in and out the ring. Especially owner and founder, Will McNamara and Director, Will Elliot.